Denys Nyzovets is from Ukraine. 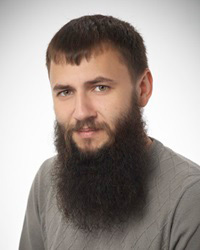 He received a Master’s degree in computer systems from Lviv Polytechnic National University. During his studies, Denys focused on optoelectronic devices at mm-wave frequencies, optoelectronic beamforming and non-mechanical beam steering based on an optically reconfigurable semiconductor antenna. In October 2016, he joined the Antenna and sub-THz group led by Prof. Yevhen Yashchyshyn at Warsaw University of Technology, as part of the CELTA ITN project. His research interests are in the areas of signal processing, smart beamforming, design of communications and radar antennas, photonic antennas. As part of the CELTA project, his PhD will be focused on optically reconfigurable terahertz range antennas. Design of reconfigurable THz antennas provides an excellent opportunity to combine state-of-the-art technologies with the antenna theory in an attempt to obtain additional degrees of freedom in system performance. The main objective of his research is the development of design methodologies and their validation through the synthesis of reconfigurable antennas operating in the THz frequency range with high functionality while assuring the highest efficiency and linearity performance with application to simple transmitting or receiving chains.